For price information and request for quotes you can contact our sales team from Monday to Friday from 8.00 a.m. to 4.00 p.m. CET. Our technical support team is available from Monday to Friday from 8.30 a.m. to 4.30 p.m. CET. For questions concerning CANopen® and CANopen® FD. With our forum, we give you another way to get in touch with us. Questions are answered in a short term by our support or sometimes directly by our hardware and software developers. The information and experience accumulated in this way is available to all customers without registration. Subscribe to our RSS feed to stay automatically informed. News about product releases as well as software, API, and driver updates are published regularly. We twitter! No matter if you have a Twitter account: Get the latest news about our products and our company in one sweep on our channel @PEAK_System. On our YouTube channel, we demonstrate how to use our products in easy videos. In particular, the first steps with our software or with complex configurations can be reproduced comfortably in this way. 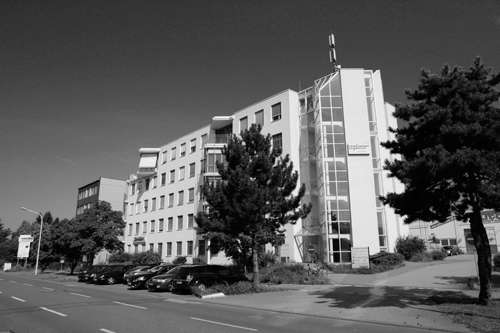 Our head office is located directly on the street "Otto-Röhm-Straße". Parking spaces for our guests (marked with "PEAK-Gästeparkplatz") are at the back of the company building. PEAK-System can be found on the ground floor and the third floor.